Elbow pain, reported to affect anywhere from 5 to 16 percent of Americans at some point in their lives, can occur from injury to any of the structural components of the elbow or from various diseases. The elbow is a complex joint, easily susceptible to pain and discomfort. Experiencing elbow pain? To get to the bottom of it, consider the elbow’s structure. The elbow is a complex part of the arm formed by three bones: the humerus (upper arm bone), the radius (the lower arm bone on the thumb side), and the ulna (the lower arm bone on the pinky side) as well as numerous tendons and ligaments. There are actually three joints in the elbow, each of which contributes to our ability to use our arm in different ways. 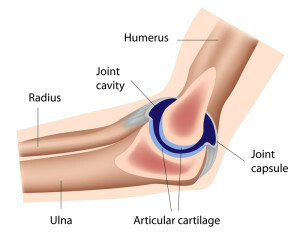 The main joint of the elbow is the humeroulnar joint, which is where the humerus and ulna interface and which allows us to bend and straighten our arm. The humeroradial joint, where the humerus and radius interface, also contributes to bending and straightening but additionally allows us to turn our hand up or down (pronate or supinate). Finally, the proximal radioulnar joint, where the radius and ulna interface, allows us to rotate our lower arm. The ends of all three bones are covered in cushioning cartilage and the joints are lined by thin tissue called synovium that secretes a lubricating fluid called synovial fluid. Various ligaments connect these three bones together and stabilize the joints while tendons from muscles in the forearm and upper arm attached to the bones allow us to move our arms, wrists, and fingers. Here’s a look at five typical injuries or injury-related conditions that can cause elbow pain. Tennis elbow or lateral epicondylitis: Lateral epicondylitis is one of the most common injuries to the elbow and, contrary to its popular name, can occur in many other people besides tennis players. Tennis elbow occurs when any of the extensor muscle tendons of the forearm that attach to the lateral epicondyle, the bony protuberance on the outside or lateral aspect of the lower humerus, are injured. This occurs most often from overuse, whether from racquet sports or from activities like chopping food or painting.The overuse results in a weakened tendon that develops microscopic tears. This damage usually occurs gradually causing slowly intensifying pain and tenderness.Rest, pain relief with non-steroidal anti-inflammatory drugs (NSAIDs), the use of braces, and physical therapy to help strengthen the forearm muscles are common features of lateral epicondylitis treatment. In 10 to 15 percent of cases, surgical repair of the tendon may be necessary. Recently, platelet-rich plasma (PRP) therapy in which growth factor components of your own blood are injected into the elbow to promote healing has shown promise as an effective therapy. Here’s a look at the structure of the elbow joint. Other areas with tendonitis: While the tendonitis that occurs in tennis elbow is the most common cause of injury-induced elbow pain, there are many other tendons in the elbow that can become injured and result in pain. For example, the biceps muscle tendon can become strained or even torn, causing pain and making it difficult to rotate the arm. Fracture: Any of the three bones making up the elbow can be broken, but the most common fracture is that of the olecranon, the bony protuberance at the end of the ulna that you can feel when you bend your elbow at a 90-degree angle. These fractures are diagnosed by x-ray and are often able to be treated with rest, pain control medications, and braces or splints. If the fracture has resulted in a dislocation of the bone, surgery may be necessary. Bursitis: The olecranon bursa is a thin, fluid-filled sac that lies between the skin and the olecranon, providing cushioning for the bone. The bursa can become inflamed and irritated from trauma, prolonged pressure, infection, or from a systemic disease such as rheumatoid arthritis or gout. Bursitis treatment is usually non-surgical and consists of pain control medications, elbow pads to protect the bursa, avoidance of activities that aggravate the bursa, antibiotics if it is infectious in origin, or treatment of the underlying disease. Rarely, surgical drainage or removal of the bursa may be indicated if these treatments are not successful. Dislocation: Dislocation of any of the joints in the elbow can cause elbow pain. The most common cause of elbow dislocation is falling on an outstretched hand. Simple elbow dislocations do not involve any damage to the bones and can be treated by a doctor manually returning the bones to their appropriate position using what are called reduction maneuvers. Complex dislocations involve damage to the bones and ligaments and require surgery. While elbow dislocations are rare, they are considered a medical emergency because the longer the bones are misaligned, the greater the risk of damage to ligaments, nerves, and blood vessels in the elbow. And here’s a look at four diseases that can contribute to elbow pain. Rheumatoid arthritis: Rheumatoid arthritis (RA) is the most common arthritis to affect the elbow. It is a disease in which the body’s immune system attacks the lining or synovium of the joints, causing inflammation and pain. The elbow can ultimately become irreparably damaged and distorted in some individuals with severe RA. Unlike other arthritic causes of elbow pain, RA usually affects both elbows. Treatment involves treating the RA itself with anti-inflammatory medications and disease-modifying anti-rheumatic drugs (DMARDs). Gout: Gout is a disease characterized by the deposition of uric acid crystals in different joints of the body. The crystals can cause pain, swelling, and inflammation in the affected joint. The most commonly involved joint is the big toe, but the elbow can be involved as well. Treatment options include NSAIDs and the drug colchicine to control pain, drugs used to lower uric acid levels in the blood, and preventative measures such as a gout diet (low in purine-rich foods that contribute to higher blood uric acid levels). Infectious arthritis: While infectious arthritis occurs more often in large joints, it can also occur in the elbow. Bacteria in the blood stream or from a skin wound can infect the elbow joint, causing pain, redness, swelling, and/or fever. Treatment with antibiotics is critical to avoiding joint destruction. Osteoarthritis: Breakdown of the cushioning cartilage in joints is the hallmark of osteoarthritis (OA). It is less common in the elbow than in weight-bearing joints but can occur, particularly as a result of overuse of the elbow. Pain control with acetaminophen or NSAIDs and activity modification can help ease the pain. Rarely, steroid injections into the elbow may be needed. anti inflammatory, anti inflammatory drugs, antibiotics, arthritic, arthritis, arthritis rheumatoid, arthritis rheumatoid arthritis, bacteria, bone, bursitis treatment, cartilage, diet, dmards, elbow pain, food, gout, gout diet, immune system, infection, infectious arthritis, inflammation, muscle, non steroidal anti inflammatory drugs, nsaids, osteoarthritis, pain, pain drugs, pain relief, purine, purine rich foods, ra, rheumatoid, rheumatoid arthritis, skin, tennis elbow, uric acid, uric acid crystals. I seen nothing mentioned of cubital tunnel syndrome. This happens when the ulnar never becomes compressed in the elbow joint. This serious condition affects the use of the pinky and ring fingers, and causes muscle wasting in the hands and forearm. Too bad this is not covered in this article.